Cleaning of your floor is the most important point of all. Preferably no water must be used and no mops. Sponge mops can be dangerous to your floor. Even new sponge mops have too much water left in them when you clean your floor. Too much water can end up staining your floor. If you follow my guidelines you will enjoy perfect floors for years to come. 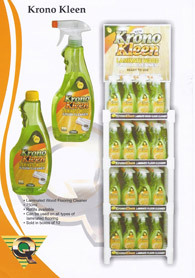 The product I recommend is called Kronokleen. It contains alcohol and all the solvents you need to keep your floor clean. No water dilution is needed. It is available at Checkers and Pick ‘n Pay family stores. The right way is as follows. Turn the nozzle to stream. Spray a couple of squirts on the floor. Wipe floor completely dry with a big clean cloth. If you don’t want to go on your hands and knees, put your broom or mop on top of the cloth. Don’t wipe the floor with the mop! Don’t use water! It’s also better to use a vacuum cleaner and not a broom. 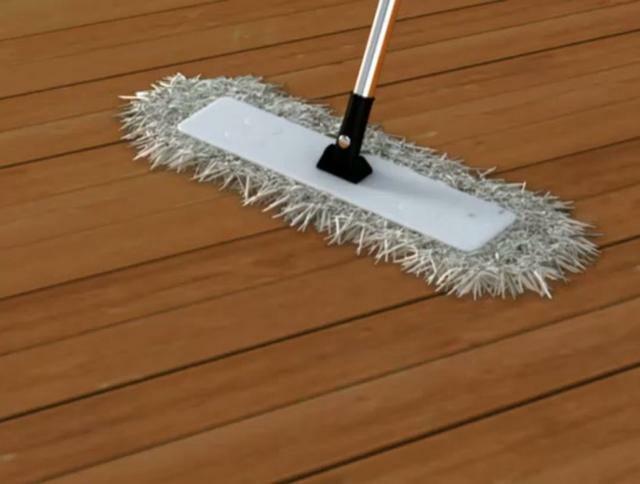 Floors can get static which makes sweeping difficult. There is however one mop on the market that is safe to use if it is applied correctly. This mop is the“MicroFibre” mop from “Verimark”. There are 2 different ones. The one I recommend is the one with the longer hair. Take the cloth off and soak it with water. Then you must dry the cloth out as dry as possible. Put it back on the mop and wipe the floor. This mop leaves so little water on the floor that it almost dries instantly giving the water no chance of damaging the floor. You can also use it just to sweep the floor. Heavy stains can be removed by applying clean acetone to a clean cloth and then wipe the stain. Do not throw acetone directly onto the floor. Acetone can only be used on laminate flooring, bamboo flooring and solid timber floors that were sealed by the manufacturer. Do not use acetone on floors that were sealed with aftermarket products. Scratch marks can be treated with a product called “Scratch Cover”. This product can be purchased from us. If you use these guidelines you will enjoy perfect floors for years to come.